Transform your business with the help of Interfacing's BPM Professionals. Adapting to the new technological scene will allow one’s organization to stay on top. Just as technology is constantly innovating, organizations should also adjust. Business transformations allow organizations to be aligned with the best practices and industry-specific expertise. Interfacing Business Transformation focuses on improving profitability, productivity and cutting costs through process optimization. Transformation should not be seen as an option, but as an imperative for a business to adapt and innovate. Interfacing enables organizations to realize the value of transformation by allowing easy initiative and adoption of our flagship product: Enterprise Process Center (EPC). The three points of the business transformation cycle are to reduce complexity, increase transparency, and improve execution. Centralization of tasks, sharing services, and supporting the sales force will reduce complexity. Transparency is achieved through data management, developing an enterprise-wide view, and leveraging improved data. Managing costs, enhancing customer service, and improving predictive are some of the components of execution improvement. 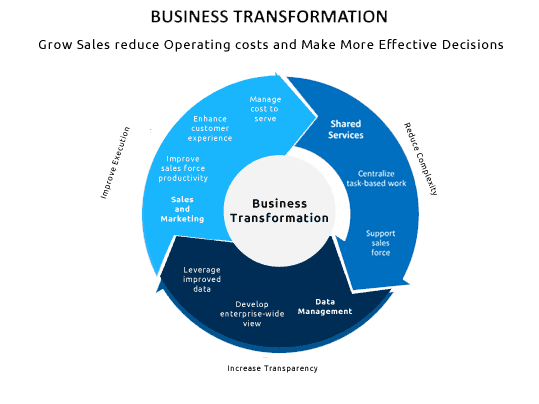 These three tactics assure a successful business transformation and result in reduced costs, sales growth, and more effective decision making. Business Transformation allows work to perform faster, smarter, and more efficiently. Employees can collaborate, communicate, and exchange data more easily with a business transformation solution such as Interfacing’s EPC. With workflow being more streamlined and optimized, productivity will no doubt increase. Customers demand increased technological capabilities from organizations due to ease of use. Adoption of modern technology will allow for delivery of increasingly effective results. In addition, with increased productivity, employees can allocate more time towards engaging with clients. Cloud solutions are commonly used in business transformation. These solutions centralize data while hosting, managing, monitoring, and controlling facilities. This reduces downtime for employees and allows data to be available at any given time. Business Transformation is not only about technological innovation but change in organizational culture. The core of Business Transformation is to enhance customer experience and reduce operational costs. Being able to deliver services and improvement at the relative speed of innovation will permit organizations to thrive in today’s competitive market. Implementation of a Business Process Management (BPM) solution, such as Interfacing’s Enterprise Process Center, will establish a foundation for continuous improvement. It will allow processes to be streamlined, optimized, and automated which will improve agility and enable organizations to efficiently maximize profitability. Business mapping of processes and operation will eliminate any unnecessary waste occurring in operations and this will improve productivity, reduce costs, and increase customer service. Automization of work results in ameliorated allocation of time and efficiency due to reduction in errors and redundant tasks. Standardization of processes will mitigate risks of operations and ensure compliance throughout the workflow. 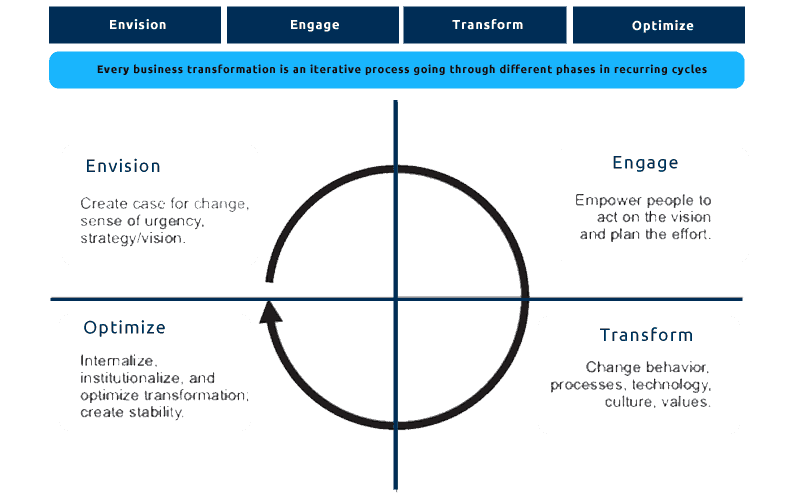 The four cyclical steps towards a successful business transformation are Envision, Engage, Transform, and Optimise. ENVISION consists of visualizing strategy and case for change. ENGAGE empowers organizations to act upon the vision and plan out the procedure. TRANSFORM is the application of the change. OPTIMISE involves internalizing the transformation and creating stability throughout the organization. Implementing all four of these steps will assure one will be able to successfully transform one’s organization and be directed in the right path of constant improvement. Business Transformation will align strategy with growth goals which allows for a continuous performance improvement.